When a community has residential fire sprinklers, the implications can be far reaching—from infrastructure decisions and water usage to enforcement and inspections. 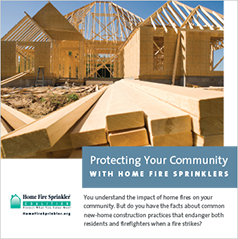 HFSC has put together a guide and video for local officials that dispels the many myths about fire sprinklers and shows the positive effect sprinklers can have on a community. This video for building officials includes interviews with experts from the National Institute of Standards and Technology (NIST) and Underwriters Laboratories (UL). They’ve conducted fire tests and research showing why fires in new single-family homes are more dangerous and how fire sprinklers protect occupants and firefighters.